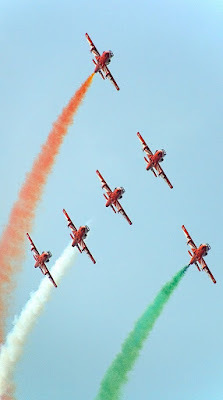 Talks are on the air about the disbanding of one of the prestigious assets of Indian AirForce -Suryakiran Aerobatic team. After the formation of team in 1996 this 'Bidar air force station' based team have performed from Dal Lake in the north to Thiruvananthapuram in the south. Abroad 'suryakiran' also performed in Srilanka, China etc. The reason for disbanding is the shortage of trainer aircraft in the air force arsenal. The currently employed trainer aircraft for pilots - HPT-32 is grounded following crashes and other technical failures. So in order to continue the pilot training program IAF don't have enough aircraft. So they are forced to disband the team and move all the HJT 16 kiran aircrafts to pilot training section. It is said that usually 140-150 pilots are on training in HPT-32 aircraft at any given time. Then they will move on to other aircraft for further training. Now HPT-32 is down, next in line to be grounded may be the other aircraft series which are infamous for mechanical failures. In the '90s, according to its own submissions in Parliament, it lost 80 pilots and 185 aircraft. Which makes it almost a squadron a year or a fourth of its entire fleet in the past decade alone. And the estimated loss: Rs 6,800 crore. According to an old estimate "The IAF loses one MiG fighter every 2,500 flight hours, making it one of the most vulnerable machines in service with any force in the world"
They may find a temperory solution by disbanding the Suryakiran team. But what will they do next? Recently Air Force celebrates 77 years of service, after these much years are we reached in such a situation where we don't even have enough aircraft to train our pilots? When this 42,000 crore MRCA deal will be finalized and start delivering? Even if it is finalized the shortlisted aircrafts Rafale, Typhoon, F16 C/D, F/A-18E/F, JAS 39 Gipen, MiG35 all are combat aircrafts, not the trainer one. The deal for 66 Advanced Jet Trainers(AJT) is one of the most procrastinated deals in aviation history. IAF projected requirement in 1984 but deal signed only in 2004, 20 years of delay. The deliveries of BAE Hawk Mk 132 finally started in 2007 , within that time may be the fighter aircraft gone one generation further. The sanctioned strength of IAF is 39.5 squadrons, with an healthy level at 44 squadrons, but currently India doesn't have that much squadrons. For power projection over South Asia and Indian ocean region IAF requires much more squadrons. MRCA deal is good one but not enough, moreover further delays will be disastrous.